Berat is one of the few places in the world that has well-preserved and rare Ottoman architecture. 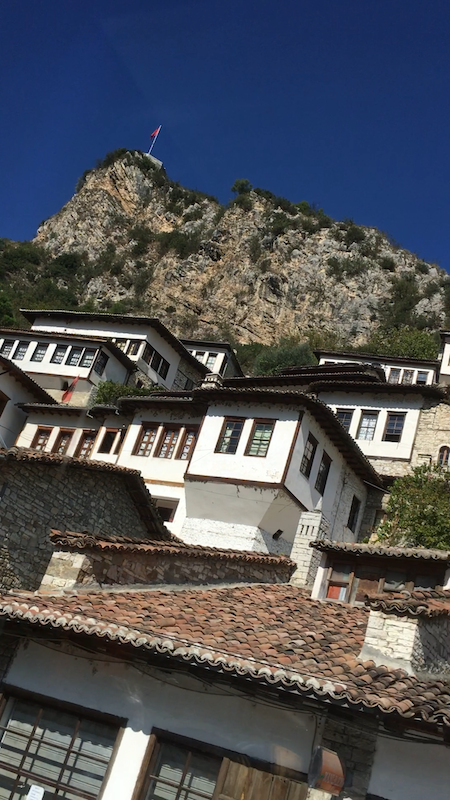 Berat is also known as the “Town of a Thousand Windows”. 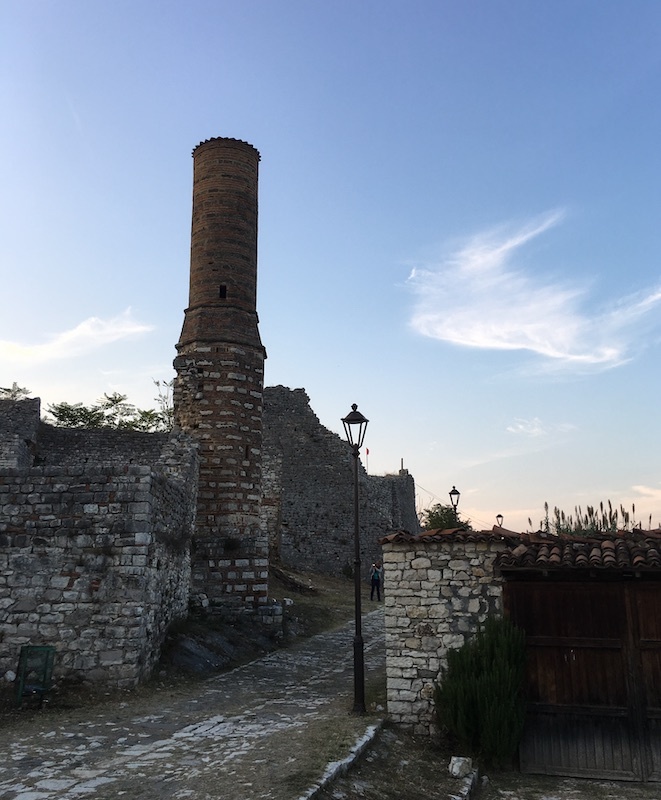 This ancient town in central Albania, a UNESCO World Heritage Site, won’t stay off travelers’ radars for a long time. 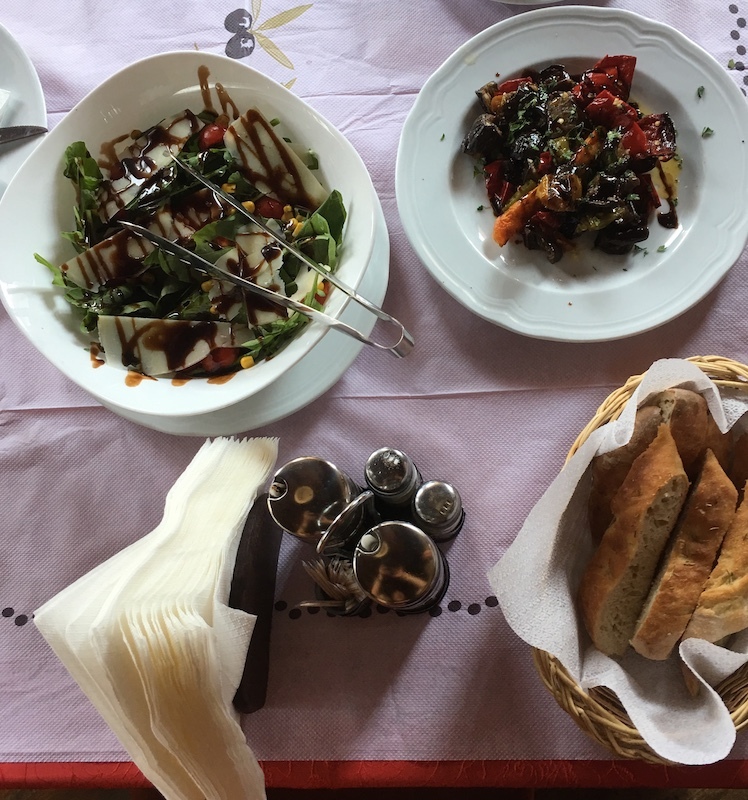 Besides the unique architecture and rich history, Berat offers authentic Albanian and Mediterranean foods at extremely affordable prices. It is 64 miles from Tirana, the capital of Albania and 103 miles from Sarande, a coastal town in southern Albania. From Sarande you can take a two-hour ferry ride to Corfu, Greece with Ionian Seaways. You need a pair of good shoes and high endurance to walk up the steep cobblestone road to Berat Castle. Some people prefer to take a cab to the top. Berat Castle, also called Berat Fortress or Kalaja was built in the 13th and 14th centuries with four entrances and 24 towers. 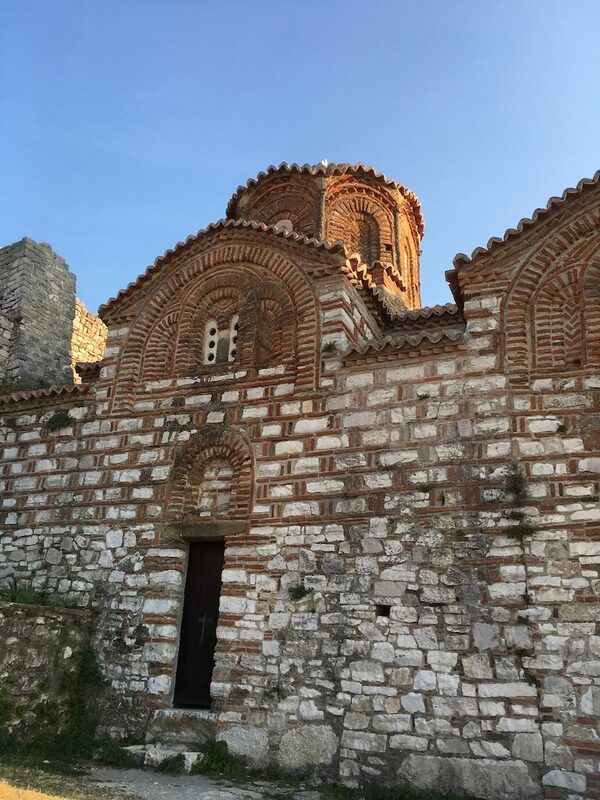 Inside the fortress are Byzantine churches, an Ottoman mosque (Red Mosque with a remaining minaret) and castle ruins. Locals are still occupying some of the ancient stone houses. The castle’s community runs shops, restaurants, and hotels that serve the locals and tourists. Visit Onufri National Museum housed in the 18th century St Mary’s Church. There is about 200 pieces of art by Onufri, an Albanian icon painter. 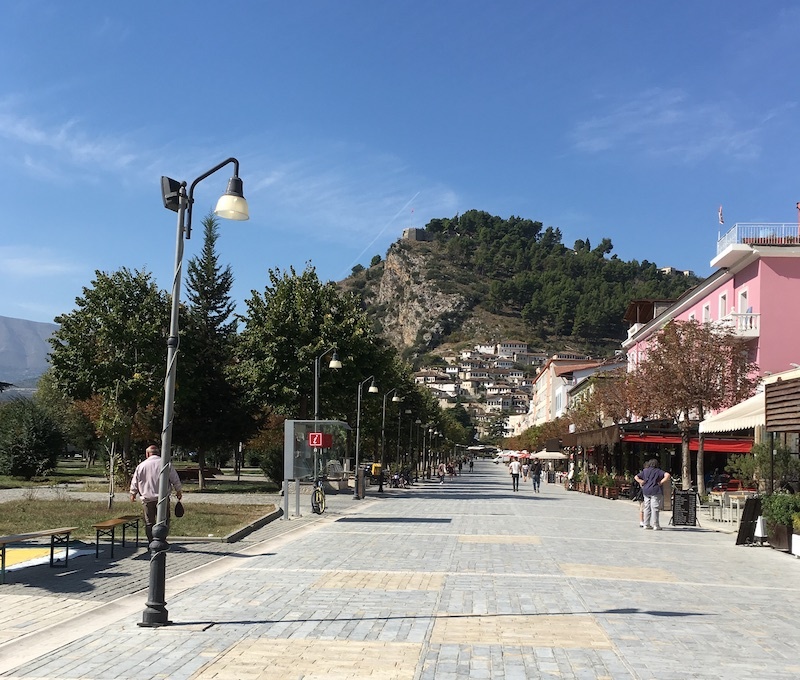 Enjoy the views of Berat and the surrounding mountains from the castle. Mangalem is the Muslim quarter of Berat, located between Osum River and the foot of castle hill. Check out the white Ottoman houses, King Mosque, restaurants, and shops in the neighborhood. Next, take the Gorica bridge to the Gorica, the Christian community of Berat. Explore the area with narrow cobbled streets and enjoy views of the Ottoman houses from Gorica. The Republic Boulevard (Bulevardi Republika) is a pedestrian walkway by Osum River. There are shops, bars, restaurants, and cafes along the sidewalk. It’s a great place to relax and enjoy a glass of wine or a cup of coffee in an outdoor setting. Bulevardi Republika is just outside Mangalem neighborhood. You have a choice of restaurants in Berat to have traditional Albanian or Mediterranean cuisine. The most famous restaurant for Albanian food is Antigoni in Gorica. If you’re at Berat Castle, we recommend grabbing a meal or a drink at Akropoli Bar Kafe. But for a proper sit down traditional Albanian cuisine go to Wildor Restaurant in Mangalem. The restaurant serves terrific pasta, soup, and good house wine. Berat is one of the oldest wine producing regions in Albania. The wine was produced since the sixth century BC. The guided tour includes Cobo, Nurrelari, and Alpeta wineries. 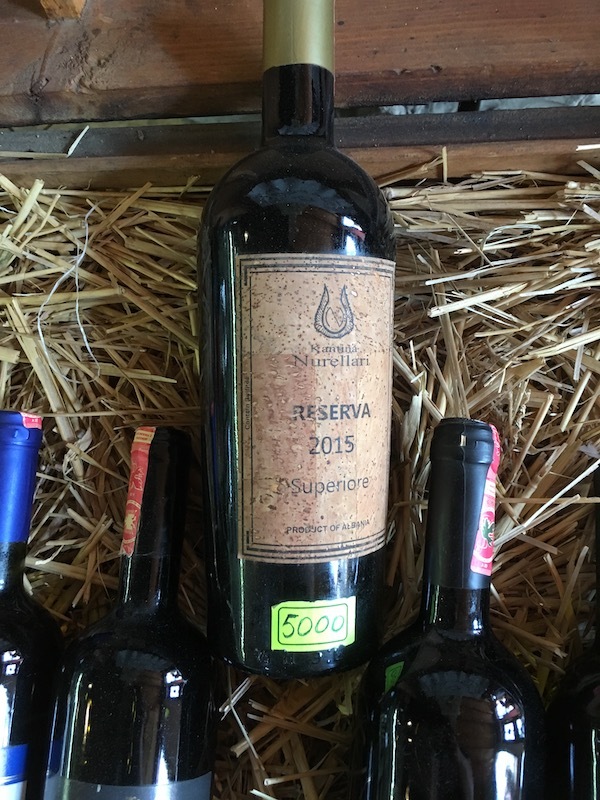 You’ll taste wine from indigenous grapes like Pules (or Puls), Shesh, and Debine. Try the Albanian white wine made from the native Puls grapes. 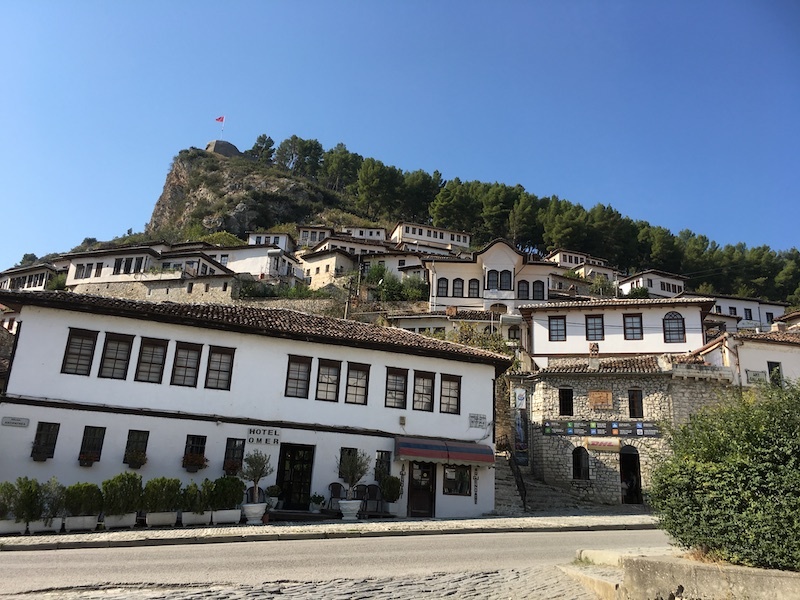 Have you been to Berat Albania?